Very happy with our purchase. With all the accessories it is a head turner. Practical. We also bought the matrix light 2, it is pretty heavy but if you want safety then would highly recommend it. Lie flat position is a brilliant innovation, we use it as a portable moses basket....I can take it to the kitchen and watch over baby. The transporter 2 car seat/carrycot is listed as compatible but not in the recommended list. Please clarify? I have a transporter 2 and strata and would consider the epic if it suited both car seats. Thank you. 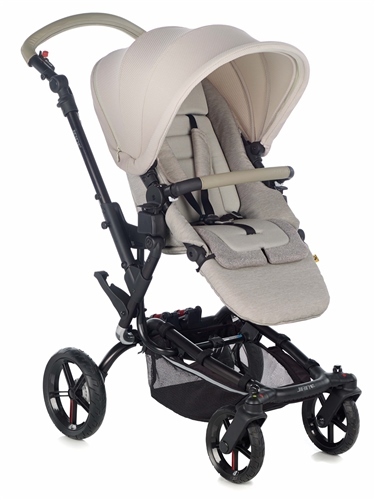 Jane UK Replies: As the EPIC pushchair is a pro-fix model (the connection system for car seats and carrycots to the chassis) and so are both the TRANSPORTER2 and STRATA car seat, then they will fit. However while they can fit, they don't have the same colours to match up, although as the pushchair and carrycots or car seats are never used together, then this shouldn't be a problem. The TRANSPORTER2 and STRATA are mainly teamed up with the TRIDER and RIDER pushchairs, so if you were buying the whole package I would recommend either of them.